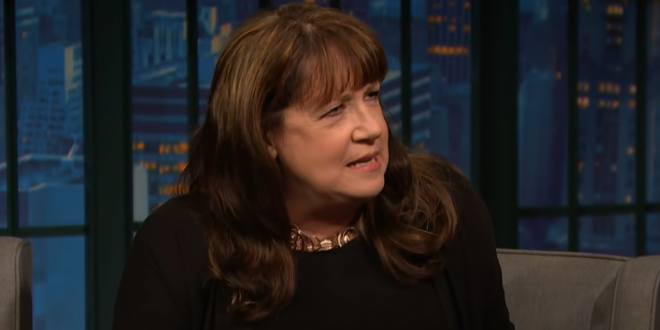 Handmaids Actress Ann Dowd: Aunt Lydia Would Make Mincemeat Out Of Sarah Huckabee Sanders [VIDEO] - Joe.My.God. Sarah Huckabee Sanders would not get an easy ride in “The Handmaid’s Tale” universe, according to one of the dystopian drama’s stars. On Thursday’s “Late Night,” actress Ann Dowd — who plays the ruthless Aunt Lydia in Hulu’s TV adaption of Margaret Atwood’s 1985 novel — claimed her character “would make mincemeat” of the White House press secretary. She was fantastic in The Leftovers.